South Africa - Cape Town headquartered event production specialists Kilowatt AV recently specified 36 Robe LEDWash 600s and 12 LEDBeam 100s for a nationwide five-city FLS (Financial Lifestyle Solutions) roadshow by leading South African financial services and investment group, Old Mutual. 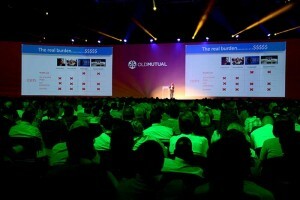 Kilowatt was the technical solution designer and provider for all shows, the largest of which was staged at Sandton Convention Centre in Johannesburg for 2000 delegates, with lighting equipment subcontracted by locally based MGG Productions. The other four shows – Cape Town, Bloemfontein, Port Elizabeth and Durban – also featured the Robe LEDWashes and LEDBeams plus Robe Pointes. Kilowatt’s team, led by project director Rhys Pughe Parry and technical project manager Jonty Mylne collaborated closely with live brand experience agency Hero to create the entire event environment. The presentation area was complete with a 48 metre wide (in Johannesburg) curved video screen featuring Logo Video Mapping, and in an adjacent room there was a large expo arena showcasing the various new products and interactive activations to all the visiting Old Mutual brokers and agents. Twenty-four of the LEDWashes were rigged on overhead trusses and used to provide the overall general stage colour washes for the presentation and all the other onstage action, for which lighting was designed by Freelance LD, Willie Botha, a regular Kilowatt LD / operator. He worked very closely with Kilowatt’s senior video director Michael Edwards to produce the overall aesthetic, which involved the seamless integration of lighting and video into a complete ‘visual experience’, one of Kilowatt’s trademarks. The other 12 LEDWash 600s were rigged around the expo space and used to light all the different areas, working in conjunction with the little LEDBeam 100s which highlighted specifics. 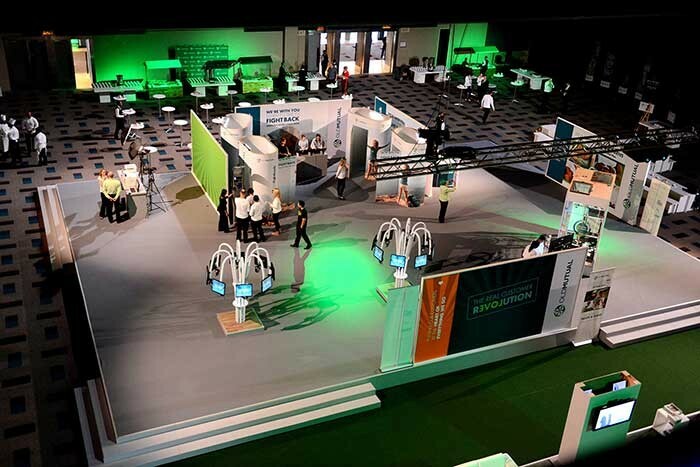 Kilowatt also supplied a total HD video solution including Christie projectors and the latest JBL VTX V20 audio system for the Old Mutual roadshow tour. Robe’s are on the lighting spec for many of Kilowatt’s events. The company owns only a selective amount of kit itself, including Robe LEDWash 600s LEDBeam 100s, 300 and 600E Spots and their original purchase of ColorSpot 250E ATs, which are still going strong after seven years of hard work. All this Robe kit was delivered via South African distributor DWR. However, with the event schedule now far exceeding the amount of equipment it is practical for them to own, Kilowatt keeps many of South Africa’s rental companies very busy with cross-hires, which in turn enables everyone to generate more business and increase their own investments. It is like a micro variant of collective capitalism for the mutual benefit of a wider cross section of the SA industry! This is an ideal scenario leaving Kilowatt’s design team free to spec kit exactly to suit each project and not being tied to using equipment just because it might be in their stock. Across the four different companies currently in the group, Kilowatt Investment Holdings currently supports around 150 events of all different shapes, sizes and complexities per month. Dillon Jearey, Group CEO comments: "We are extremely selective about the gear in which we invest, and for lighting we look at well-designed fixtures that will give us the most overall use across all the areas and levels at which we work. Return on investment is crucial to us, but of course the service and back up is also fundamental to this equation – and from DWR this is absolutely second to none." Kilowatt is headquartered in Cape Town and another USP of its business is working closely with the agency or client right from the start of a project rather than being brought in as a technical provider later down the line. Currently with 87 full time employees across the Group, a large skills base and plenty of energy, imagination and enthusiasm, Kilowatt is definitely ‘one to watch’ both in South Africa and internationally as the scope of their work expands.